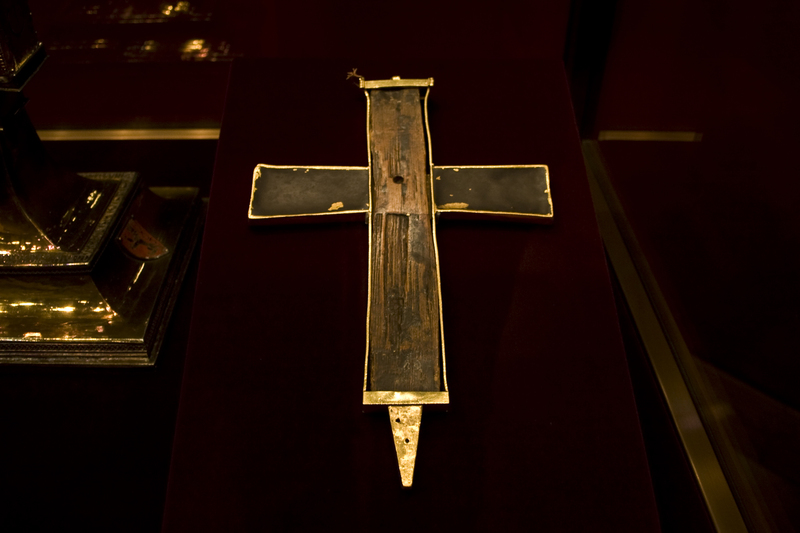 Almost certainly the rite of veneration of the cross originated in Jerusalem toward the end of the fourth century and in Rome in the seventh, and the rite was directed toward the principal relics of the True Cross kept in these cities. Only later, when the rite became common, was the sign of veneration usually reserved to the True Cross extended to the crucifix used in the celebration. While the object of adoration or worship is always Christ, the special veneration of the cross on these days seems to say that although the tabernacle is empty, all other images covered, and the Church silently awaits the resurrection, his divine presence is symbolized by the image of the cross through which he saved us from our sins. Although no longer mentioned in current legislation, the custom of making a simple genuflection before a publicly exposed relic of the True Cross or another relic of the Passion remains in force. The Ceremonial of Bishops, No. 92., indicates that the relic of the True Cross (and by extension other relics of the Passion) is incensed with three double swings. Other relics and images of the saints are incensed with two double swings. All relics are incensed while standing. The Ceremonial of Bishops, Nos. 866 and 921, however, also forbid placing of relics upon the altar, and no exception is mentioned for relics of the Passion. So if the reliquary is exposed in the church, it should be distinguished with a place of its own such as a column or table in the sanctuary, a side altar, or some other suitable location. Older legislation on relics can be found in Italian in Nos. 614-618 of Ludovico Trimelloni’s thousand-page “Compendium of Practical Liturgy” published in 1962 and recently reprinted for the benefit of all those who follow the extraordinary form. This work contains some norms that have no current equivalents in liturgical legislation and can, therefore, be used as guidelines of historical practice. We mention those which could still be relevant today, leaving out those which are no longer in conformity with current norms and practice. Before a solemnly exposed relic, at least two lamps are lit. These are distinct from the Mass candles. Only relics of the Passion can be carried under a canopy or with a humeral veil. Both canopy and veil are violet on Good Friday and Holy Saturday, red on other days. Relics are never exposed during funerals or during the celebration of the Passion. Where the tradition exists, there may be a procession on these days with the relic of the Cross or of the Passion at the end of which a blessing may be imparted. The mode of exposing the relic is the following: The closed or covered relic is carried privately to the place of veneration before exposition begins. The priest or deacon vested with alb, surplice and stole comes to the place of exposition, uncovers the relic, and then reverences and incenses it. After this, he may remain standing or kneeling for appropriate prayers and songs or he may return to the sacristy. The previous norms said that before reposition a blessing was obligatory for a relic of the Cross or Passion, facultative for other relics. This blessing may be carried out by the priest alone or with the assistance of a deacon. In this latter case, the deacon passes the relic to the celebrant and receives it after the blessing while both remain standing. However, since current law allows a deacon to impart eucharistic Benediction in the absence of a priest, there would seem to be no reason why a deacon could not bless with a relic in similar circumstances. In the case of the relic of the Cross or the Passion, a humeral veil may be used. Before the blessing, the relic is incensed. All kneel when receiving the blessing. Before reposition, all relics may be presented to the faithful to be kissed in a manner analogous to that used for the adoration of the cross on Good Friday. In presenting the relic for kissing an appropriate formula may be used but is not obligatory. For the reposition, the reliquary is veiled and taken to the sacristy or its habitual place of conservation. If there has not been a blessing, then it would be incensed before reposition. During exposition, kissing and reposing appropriate hymns may be sung.